•	All merchandise offered on the Flex Shopper website is heavily discounted as it is, but customers coupon codes and special offers lower prices even more. Visit the TOUCHDOWN ZONE during football season, for example, to find deals and offers good for up to 45% off of electronics purchases. •	Special in store financing options are available for all customers that shop the Flex Shopper website. Customers must apply for special financing and be approved, but approval is easy and straightforward. Bad credit is accepted. •	Free shipping offers are available to customers in the US. Orders must be at least $100 total, and overnight shipping options are available as well. 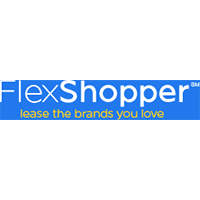 Flex Shopper offers financing for a full range of items. This is actually a lease program that offers items from a full range of brands. All of the item categories are listed to the left of the landing page. There is a video on the landing page that consumers can watch to get a better understanding of the program. There is a short application that users can fill out to qualify for the program. In many cases no money down is required. If the company does not have the product in stock they offer a service to find the product. For most up to date offers check out Flex Shopper on Facebook and Twitter or contact Flex Shopper Support for any questions.